Like everybody across the galaxy, I love Peanuts, Charles Schultz's genius comic strip about the defeats life metes out to us, and the consolations we can sometimes find in religion, music, or our own imaginations. One of my few happy memories of grade school was reading from a big hardcover collection of Peanuts strips that sat on the classroom bookshelf, I guess in 2nd or 3rd grade. My grandmother would save us the comics from the Newark Star-Ledger and when we were at her place on the weekends we kids would read an entire week of comic strips. When we were older we would buy the old Peanuts paperbacks, the ones with strips from before we were born, at used bookstores. 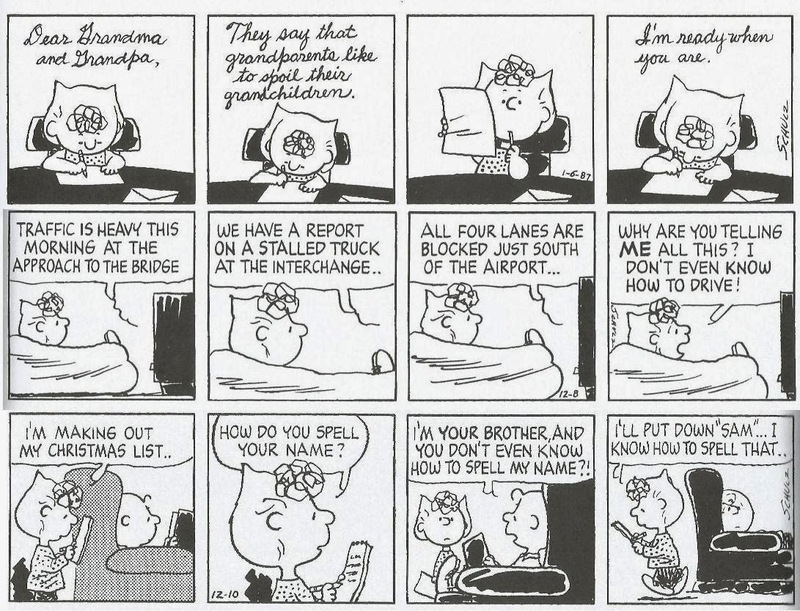 I still remember laughing hysterically when, for the first time, I read the strip in which Linus is energized with a lust for power and decides to run for class president. 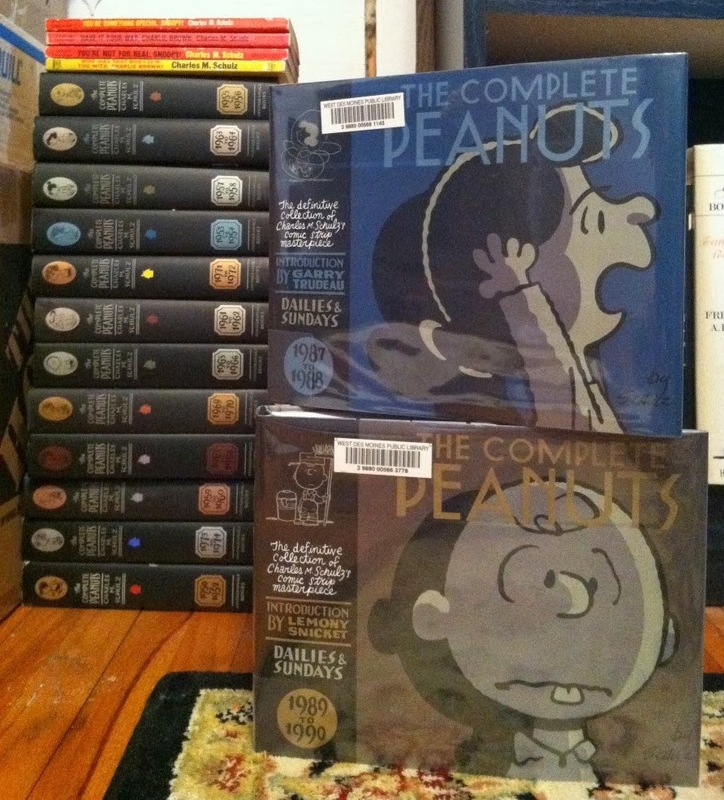 When Fantagraphics announced they would be printing The Complete Peanuts, two volumes a year, each volume covering two years of the strip, it was great news, and Fantagraphics has lived up to the hopes I had back in 2002. The books are well-designed, showcasing Schulz's work without being too large or unwieldy to read comfortably. They started coming out during that period of my life when there were still green pieces of paper in my wallet, and I bought each of the first twelve as they appeared. The more recent volumes I have been sporadically borrowing from the library. This week I borrowed the volumes covering strips from 1987 to 1990. The 1987-88 volume is introduced by Garry Trudeau. I think the last time I read a Doonesbury strip was during the 1990-1991 Gulf War, when one of the characters commented on the survivability of the controversial Bradley IFV. Doonesbury was in the Rutgers student paper, as was Dilbert, which I have never really liked. The real star of the Rutgers paper was the brilliant Jim's Journal, which became a topic of conversation at Rutgers, with many people not liking it and wondering why it was in the paper at all. In his introduction Trudeau reminds us that the cognoscenti hate George W. Bush and supported the communists in the Vietnam War; you know, in case you had forgot. My favorite Peanuts strips are often the ones in which the characters go on some kind of trip or adventure; I like seeing the characters in a different milieu. The summer camp story arcs are often very good, and in 1987 Schulz combined the summer camp trip of Peppermint Patty and Marcie with another classic theme, that of unrequited love, with Marcie missing "Charles" and calling his home repeatedly from camp. Patty warns Marcie that "Chuck" will break her heart, and we know Patty is right; as Proust and our own lives have made all too clear, love often flows in only one direction. Some of the weakest of Schulz's strips are the ones that rely on puns instead of on the particular personality of a character or some horrible life experience. 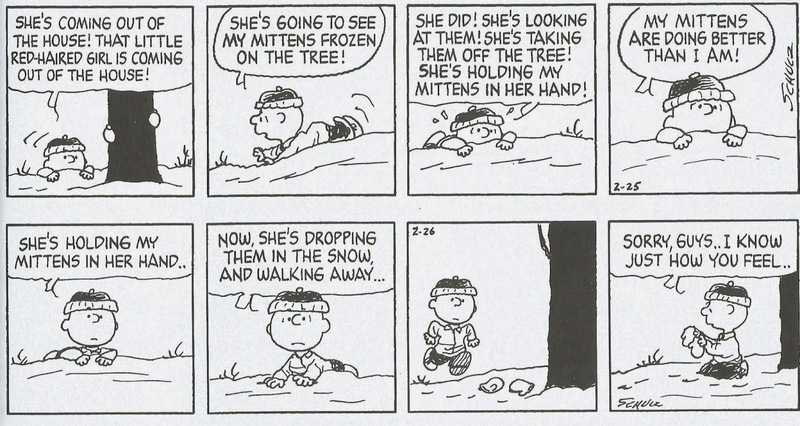 In this volume we get a Sunday strip in which Charlie Brown throws pennies at Lucy Van Pelt and then admits that it is true that you can't solve a problem by throwing money at it; this is one of the better pun strips, because it is integrated with our knowledge of how hapless Charlie Brown is and how much of a troublemaker Lucy is. On the weaker end of the spectrum is Sally Brown's mistaking electoral violence in a foreign country for "violins," though I suppose this strip reflects Sally's indifference to the outside world - when corrected she says, "Whatever." Sally's venality and solipsism is one of the things that struck me in this volume, and here are some of her greatest hits from 87-89. Another thing that I noticed in this volume was that starting in late February of 1988 the daily strips, which had been four panels forever, are now shorter, usually three panels, sometimes two large or even one single panel, a few times four tall narrow panels. (Back in the 1950s and '60s, the four panels were actually wider than they were tall; in 1987 the panels are square.) This change is obvious in the context of this book, because the dailies, which used to fill the page, now leave wide margins. Was this an artistic decision made by Schulz, or had something changed in the newspaper industry? The quality of the strips does not seem diminished, and perhaps Schultz welcomed the flexibility of being able to construct strips with a variety of shapes and volume. This is a fun volume, with numerous clever story arcs (Snoopy is in the hospital with a hockey injury; Charlie Brown trades his right fielder, Lucy, for Peppermint Patty's right fielder, Marcie, and gets Patty to throw in a pizza to seal the deal; Peppermint Patty wears a distracting wig for her class picture) and some laugh out loud moments, like a perfect drawing of Snoopy as an angry chauffeur, and Lucy declaring, "Snapping your fingers is what you do when you want to look cool." In addition, all you Eudora fans will want this volume, as, I am told, her single appearance in 1987 is her final appearance in the strip.